Pulse Light Clinic: Hello Jennifer, let’s start at the beginning, what made you get a tattoo in the first place? Jennifer: I wanted to have something that was unique to me, a bit like showing off without having to act up. There was also a bit of daring involved because tattoos on women were somewhat frowned upon in my family! Pulse Light Clinic: What kind of tattoo did you have? Jennifer: It was copied from a photograph of a sailing boat that I had a wonderfully romantic time on! It was on my left shoulder, black/blue ink, with some red and white inks as well, and it measured about 10cm by 6cm. Pulse Light Clinic: Did the novelty soon wear off? Jennifer: No, not at all, I loved it for a long time. Pulse Light Clinic: So what made you decide to have it removed? Jennifer: As I got older, and especially when my daughter became school age, I found myself hiding it. Like, when I took my daughter to and from school, I would deliberately not wear clothes that left my shoulders bear. I didn’t want anyone to associate my daughter with a tattooed Mummy! I felt that would be unfair and she may suffer some bias that had nothing to do with her own personality or behaviour. Then one day I just decided it was silly to be introverted and self-conscious, so I looked into having it removed. Pulse Light Clinic: When did your PicoSure Tattoo Removal treatment start, and how many treatments have you had so far? Jennifer: My first treatment was last October (2014), and I had my fourth treatment in April, and my next is due this month. 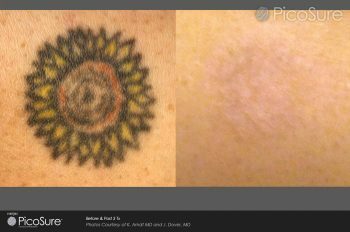 Pulse Light Clinic: Now, be honest, is PicoSure Tattoo Removal treatment painful? Jennifer: I can honestly say it’s not, obviously there is some discomfort and you need to follow the after care procedures, but frankly it is not as painful compared to having the tattoo done in the first place. Pulse Light Clinic: How many more treatments will you need before it is gone? Jennifer: Take a look for yourself (Jennifer shows the host her left shoulder). Pulse Light Clinic: Wow, I can just see some faint marks, but I really have to look for them! Jennifer: I know! the results are incredibly fast, because the PicoSure machine they use is apparently a huge leap in technological wizardry. I must say I am very impressed with it. Pulse Light Clinic: Would you ever get another tattoo after this? Jennifer: I wouldn’t personally, but I still think tattoos are fabulous. Now we have PicoSure I would say if you would really like to have a tattoo, go for it! You can enjoy it for as long as you want, and have it removed in a relatively short time once you’ve had enough of it. My friend Andrea is getting hers removed too, so she can have another one in it’s place! I think the new PicoSure machine has changed the whole concept of tattoos, because they’re not forever now, unless you want them to be.